December is always a busy time of year for the Yarm Lions, and 2018 was no different. Yarm Lions decided that the annual Santa Sleigh around the local estates would be replaced with the Santa Sleigh being parked in a local supermarket car park. This eliminated potential problems with inclement wintry weather, but had the bonus that everyone knew where we were. Hopefully, we will have a Christmas Charity Collection at ALDI on Friday 7th, Saturday 8th, with Santa Sleigh on Sunday 9th. 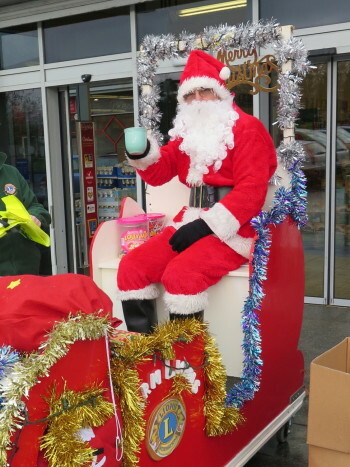 Next will be a Christmas Charity Collection at Sainsbury’s in Yarm on Friday 14th,and Saturday 16th, followed on the Sunday with Santa Sleigh at ALDI. Santa (and his helpers) are now recuperating, getting ready for Christmas 2018. Yarm District Lions would like to thank the management of all the stores involving for allowing us on their premises to raise funds, but primarily, thank the customers for their continued support and generosity. If you would like to make a donation to help us to support those in need locally and further afield, please get in touch - you can call us on 0845 833 7419 or send a message by clicking on "Contact Us" in the tabs above. Thank you. Copyright © 2019 Yarm District Lions. All Rights Reserved.